Pioneers in the industry, we offer knurling rollers from India. 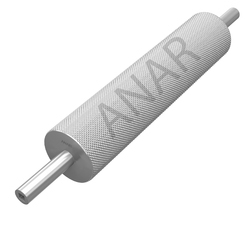 Anar Rub Tech Pvt Ltd manufactures wide range of Knurling Rollers. Available in different type, Sizes and capacity for different application in the Industries. The Knurling Rollers are widely used for its durability, reliability, corrosion resistance, moisture resistance, etc. Knurling Rollers are known as Brush Rollers also and used in Construction, Printing Machines, Rubber Industries, etc. Please ask us for special application rollers in any dimension and size with any capacity. Please contact us for your requirement.